Staying on top of educational topics can be time consuming for teachers, certainly when following courses includes traffic jams, parking problems or rescheduling teaching hours in different schools. Therefore, the department of Education from the city of Ghent started two years ago with a virtual class for Storyline Approach. The Storyline class is part of an e-learning project for teachers, offering them several educational courses by computer. The virtual Storyline class is offered to the Ghent teachers in combination with real time consultancy in their classes or meetings amongst colleagues. E-learning is for the developers just another tool in their assortment to stay in touch with the Storyline teachers. The e-learning class offers an introduction in to Storyline and summarizes the theory behind the stories. However, the main aim of the class is creating and consolidating a network where teachers can share their experiences with fellow teachers and consultants of the Pedagogical Counselling Centre. Experienced Storyliners can contribute their stories to the class, all kinds of interested people are informed and newcomers can have the look and feel of Storyline on their computer before starting a real time training or taking the first steps in the Storyline world with their pupils. A virtual coach gives advice when asked and a forum is established to stimulate communication between the participants. In 2006, more then 30 Ghent Storyliners were connected through the e-learning network. These teachers, together with their three coaches working on the Pedagogical Counselling Centre of the department, form nowadays a growing enthusiastic family, sharing their experiences and spreading the Storyline idea. 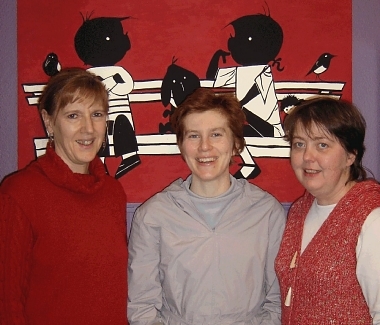 The three initiators of the Pedagogical Counselling Centre, Griet De Baecke, Liliane Van Acker and Ria Carette (see picture), have already made plans for future initiatives. It is our aim to get more participants on board. Another goal is to create a translation of the virtual Storyline class in English. In this way, the Ghent Storyline family can reach out an easily meet their “nephews and nieces” from abroad.